Sometimes, the best love relationships are the ones that are based on friendship. As is the case with Hannah Hartley and Diane Schultz, two transgender women who met four years ago during an LGBT community meeting at Affirmations in Ferndale. “Diane caught my eye from the first moment we met. She seemed to have an elegance and a kindness that made me think, ‘I really need to know that woman,'” said Hartley. The lesbian couple from South Lyon made a connection that was more than just superficial. They spent time getting to know each other’s likes and dislikes, engaging in heart-to-heart conversations, and were able to lean on one another for support during their simultaneous gender transition. Schultz played it cool a year into their friendship when Hartley was ready to share that her feelings had developed. A little persistence and what Hartley calls her “excellent art of persuasion” led to their first date in May 2014 when Schultz prepared a “beautiful” dinner and things just clicked. During the summer of 2016, Hartley and Schultz journeyed to the LGBT-friendly city of Saugatuk in west Michigan for their first post-transition celebration. Their road trip destination was a quaint bed and breakfast off the beaten path. “We had the opportunity to venture to the neighboring town of Douglas where we found a true diamond in the rough, the Everyday People Cafe,” said Hartley. That’s where Schultz pulled off a surprise wedding proposal in front of a crowded dining room plus a few thousand people on social media. “Hannah lives on Facebook and has developed quite a following in our community, so I thought it would be appropriate to share with our family and friends,” said Schultz, adding they will return to Saugatuck for an intimate wedding on June 17. 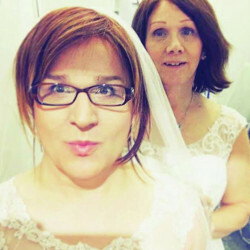 The most nerve-wracking part about planning a wedding for two transgender brides, according to Hartley, is finding a dress. “Shopping for gowns was something that terrified me from the very get-go,” she said. Designers aren’t quite in tune yet with a transgender woman’s fashion struggles, which can make it difficult to assert their own presentation of femininity. So they went for it, visiting multiple bridal shops, but one in particular, David’s Bridal, went above and beyond what they had expected. “It didn’t really bother Diane, but I wasn’t sure if we would be accepted. We forged ahead, going anywhere a bride would look and decided not to overthink the process, but at the first bridal appointment, I completely freaked out heading into the store,” said Hartley pointing to her overzealous announcement to the woman behind the counter that she is transgender. “I asked, ‘Is that going to be a problem?’ And now that everyone knew that I was trans, at least I was through outing myself and could take the next steps in the process. The staff and manager of the store turned out to be supportive and courteous while helping us,” she said. “We even had support and acceptance from other brides purchasing their gowns and accessories. 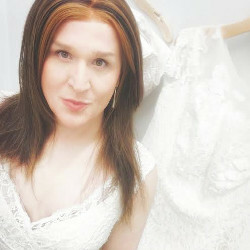 We have seen a dramatic increase in overall acceptance of our trans identity in the past few years and were a bit surprised how easy, happy and pleasant our experience was.” Both women selected “incredible” dresses around $750 each – a trumpet-style gown for Hartley and an A-Line gown for Schultz. The LGBT-friendliness continued when the couple contacted Vacation Rentals by Owner online to secure a 4,400-square-foot space – a restored barn from the 1860s – for their ceremony and reception. “We explained that we were both transgender and we planned on getting married at The Barn. This is where the rental agent said there might be a problem and was silent for what seemed like five minutes. We were sure we were going to have to keep on searching. But then she explained that the only problem was the owner of The Barn has never before allowed the location to be used for an event such as a wedding. We got the green light to have our wedding in this gorgeous barn,” said Hartley, noting the importance of getting married in the same town where they were engaged and are welcome. Hartley and Schultz chose their friend, LGBT-inclusive photographer Steven Wieckowski, who owns Swift Creek Creative, because he understands their vision when creating images. “I felt it was important to select someone that was familiar with the transgender community and would be comfortable and relaxed working with us, and have an ability to help capture us looking our best and not feel awkward while capturing such an important and intimate day in our lives,” said Schultz. The couple passed on hiring a wedding DJ, opting instead to use their iPhones with personalized wedding playlists. They learned about Chef Bill Campbell with Flavour by Bill by word of mouth. He will cater the event, as well as provide flowers – a rustic mix of Lisianthus, Liatris, Wax Flower, Queen Anne’s Lace, Hydrangea and Sea Holly in coffee cans painted in a variety of yellows, oranges and greens. Both Hartley and Schultz will carry a traditional bouquet of red roses. Since The Barn can only accomodate 20 guests, the couple plans to broadcast their ceremony live on Facebook and will host a reception, the “Two Brides BBQ,” during the summer this year.